Shop Floor Automations (SFA) will present to our audience a week-long celebration of MFG DAY, which takes place October 7th. The National Holiday is a celebration of how the industry has evolved in recent years, with a heavy focus on pulling in a future generation to keep the job field thriving. SFA will roll out the red carpet for MFG DAY by providing followers a day-to-day parade of content relative to the Holiday the week it occurs. Informative blogs, a video, maybe even an infographic, will be just some of the fun content to experience. We may even give out one of their hilarious G-code T-Shirts, but definitely, count on a discount to celebrate the Holiday in our online store! 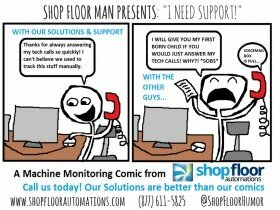 Could an MFG DAY related strip from our new comic series called “Shop Floor Man” (which is pictured to the top left and may be clicked on to magnify) be coming? We are also reaching out to some of their amazing customers in the Manufacturing field to get their stories and insight from the work they do, which will hopefully be included in these celebrations. Follow what we will be up to on Twitter at both @SFA_inc and @ShopFloorHumor. We are also on Instagram and Facebook under the username ShopFloorAutomations. Look for all of our MFG Day related content on our website blog. Fill out our contact form, so we can get in touch with you on your time. Remember – when tweeting about MFG Day, please use the tag #MFGday16 or use it to keep up with the fun events on this momentous day!